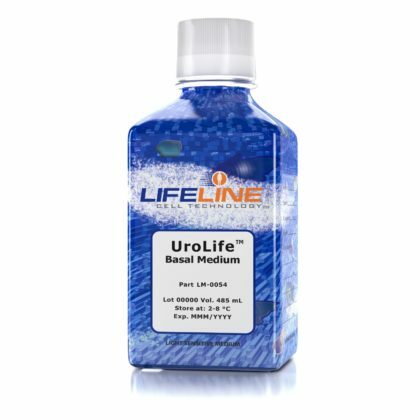 UroLife™ A Medium is optimized for the culture of human bladder epithelial cells from the apex region of the bladder, also known as the neck or trigone. UroLife™ D Medium is a fully-supplemented frozen medium optimized for the culture of human bladder dome epithelial cells. BronchiaLife™ Medium is optimized specifically for human airway epithelial cells. OcuLife™ Cell Culture Medium is optimized for human corneal epithelial cells. DermaLife K and DermaLife K Calcium-Free are optimized for human keratinocytes. MammaryLife™ Cell Culture Medium is optimized for human mammary epithelial cells. RenaLife™ Medium is optimized for human renal epithelial cells. ProstaLife™ Cell Culture Medium is optimized for human reproductive epithelial cells (prostate, seminal vesicle).